Everybody knows how important it is for drop shipping store owners to have good-looking product images on their websites. We know that the more appealing these pictures are, the higher are the conversions. The reason is simple: in e-commerce, these illustrative materials are the ultimate source of knowledge for buyers who don’t have the chance to see the items in real life. Many online shoppers don’t even read product description and base their decision on pictures only! It’s safe to say that product images are the main and the most important content element in a whole online store. Basically, the power of visual materials in e-commerce is infinite, and obviously, their quality determines the success of the whole enterprise. It’s really challenging to build a successful online store if the photos quality is low. This is why we happily introduce a revolutionary solution: please welcome Image Editor! 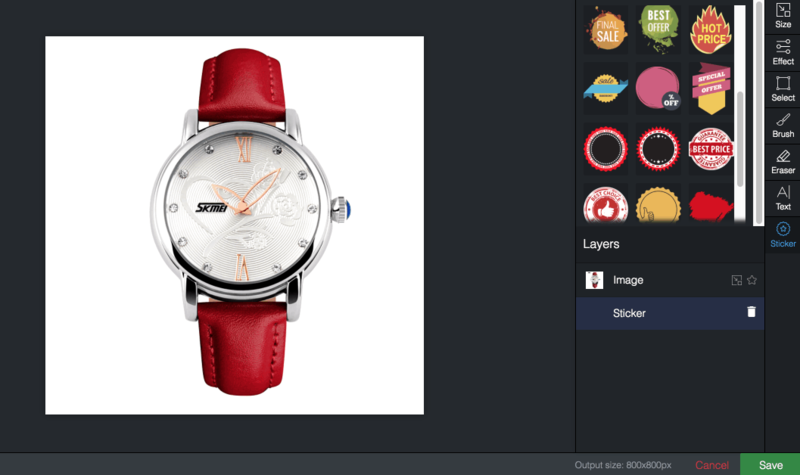 Image Editor from AliDropship team is a time-saving, user-friendly tool that allows you to bring product images to perfection in seconds. Say goodbye to spending long hours on editing AliExpress pictures, forget paying for premium image editors subscription – Image Editor helps you create professionally looking, high-quality images out of generic AliExpress pictures. Enjoy the game-changing solution that works exclusively for your benefit! Image Editor is a free Photoshop-like online tool that is now integrated into AliDropship plugin. It would make no difference what store platform you have – this algorithm would be the same in any case, regardless of the technical solutions you’re using. Every new product imported from AliExpress would mean that you need to go over with this again and again, wasting your precious time and energy on dull and boring tasks. Thanks to the built-in Image Editor, these times are now gone. From this day on, you’re able to create lovely looking and income-generating product pages without any extra effort! With the help of Image Editor, you can make any necessary changes into the pictures during the process of importing products from AliExpress. You don’t leave the importing page. You don’t browse any new tabs. You don’t open any slowly loading offline image editors. Click the image, improve it, and save the progress – it’s as simple as that! The results of your work will be instantly saved, so you’ll be able to proceed with editing your product page in a quick, easy and enjoyable way. All the users of AliDropship plugin can enjoy this Image Editor free of charge! Isn’t it the perfect time to finally get the plugin and start building a profitable, beautiful, smoothly working drop shipping store with its help? To learn more about the technical use of this outstanding solution, go to this section of our knowledge base and find the detailed overview of the process. Plus, feel free to write your message in the comments section below. We will be more than happy to help you – it’s our ultimate goal to help you enjoy your newly found drop shipping business. Wow, thanks for this super user-friendly plugin. it saves a lot of my time. Thanks A million, just tested and it working awesome!!! Hope it will bring some sales. Why don’t you edit the title of your product? I thinks is to long. Yes. AWESOME!I used photoshop for this….not anymore. Fantastic! But also available for woo? It is available for Woo in AliDropship Google Chrome Extension. As for editing images directly from your WordPress admin panel, this feature will be added soon! Nice feature. And they should also focus on their pricing calculation as the formular per item instead of price range only. How can I add this cool feature to my Ali dropship store? Is it possible to be able to delete some content like the store info, Returns and all of that extra stuff which are not in the gallery (bottom of the page)? Images on the gallery got a delete icon on the bottom but some images & text boxes got nothing so you can delete. Using the tool is nice but cropping or let me say changing the size of the image is working in a wrong way because what it is doing now is cutting the image off and it should not do that. it should shrink the whole image and add more pixels if needed. I think the best approach is to change the size of the image canvas (frame) then add handles to the image itself so the user can change the image (the content) to fit into the new canvas size. I know it is a new add-on and needs time but something to think about or re-consider. This is a nice addition to the plugin. However, I would have been a lot more impressed if you had also included what is probably one of the most important features for product photos now – which is being able to change any picture content to an all white background. I currently use a free 3rd party tool but it is a major pain point for me to have to upload the pics I need to fix from the imported items in the tool, then copy the edited versions back in to my website, and then reference them properly in the product gallery. It’s a major time waster and I would have given this enhancement a big 5 stars (heck 10 stars) if that feature had been included. Congrats and wish you Success in your future initiatives. Alidropship Built-in Image Editor is the Great and Awesome Tool which i accept with open heart and open Arms ..thank you…thank you..thank you. Awesome…very useful indeed! Thanks, Yaros! It’s a great tool, but you need a crop tool because if the background is not pure white it hard to colour match. Then you can just simply crop it out.